Sounds simple, right? In some ways, it is. It’s a simple concept to understand, but can be difficult to implement unless you have the right structure and tools in place. In order for a company to outperform its peers this ability must be stronger than their competition. Hiring Success transcends a few great recruiters or some terrific lucky hires. It is mission critical that CEOs ensure that Hiring Success becomes a core corporate muscle that all their employees can flex, and a systematic and repeatable component of their daily operations. Today’s companies operate in a far more fast-paced & disruptive business workplace than ever. Software is consuming the world. Technology innovates at 10x the speed it once did. Societal values and tastes change overnight. The rise of the internet has changed what it means to be global and local at the same time. Companies that can best manage this change will win while others wither and die quickly. In the 1960s, the average S&P 500 company remained on that list for 33 years. By 1990, that tenure shrank to 20 years. 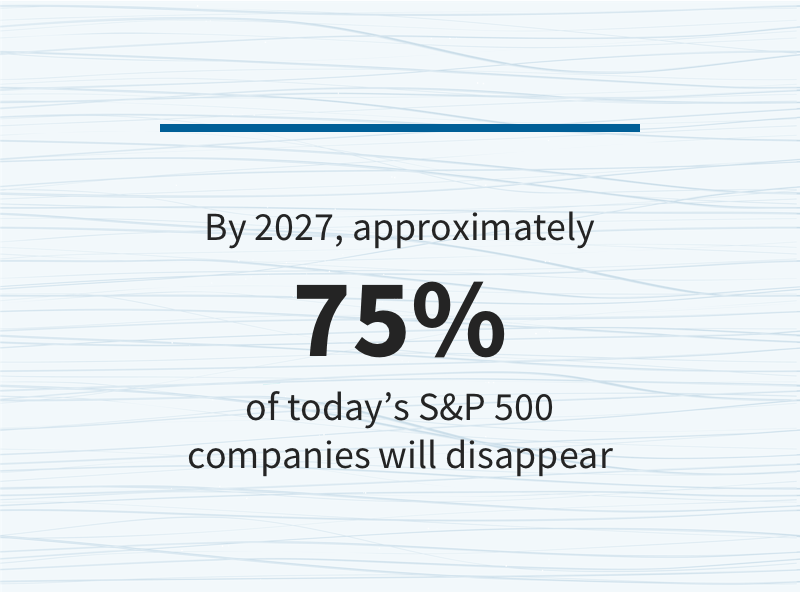 By 2027, approximately 75 percent of today’s S&P 500 companies will disappear — through bankruptcy, mergers, or acquisitions. At one time, long-established companies such as Exxon Mobile, Procter & Gamble, and DuPont dominated the economy. Today, companies with the largest market cap include primarily people-based information-capital businesses, such as Google, Apple, Microsoft, Facebook, Netflix, and Amazon. The core differentiators of today’s leading companies is their employee base and their ability to out-think, out-innovate, and out-execute the competition. Such industry disruption has led to a world in which a huge talent gap exists in terms of raw supply of qualified employees. 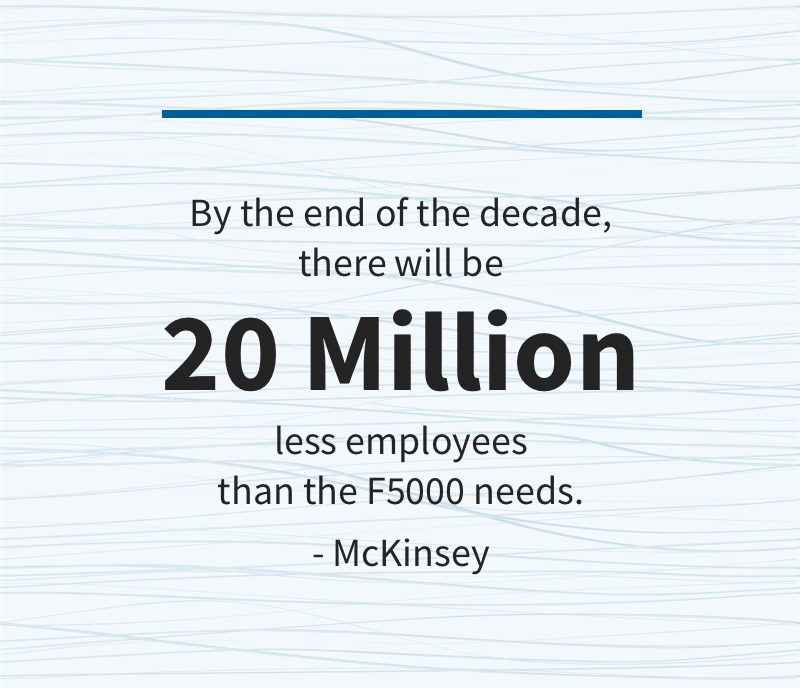 By the end of the decade, according to the global consulting firm McKinsey, there will be 20 Million less employees than the F5000 needs to hit its revenue goals. Even today, demand outstrips supply in almost every country on earth and according to the Manpower Group’s 2016 Talent Shortage Survey, 40% of employers globally are having trouble filling positions. Terrific candidates are well aware of the new math and expect to be courted and communicated with in a manner that befits this new reality. In recent years we’ve seen forward-looking companies / CEOs who prioritize their organization’s ability to hire amazing people routinely outperform their competitors in the marketplace. In fact, according to The Boston Consulting Group, the best hiring organizations have more than three times the revenue growth than the poorest in any given industry. These returns intuitively make sense given the rapidly changing dynamics of the market companies compete in today. Planning horizons are shorter than ever. Better people perform better. Poor hires lead to turnover and discontent. Great hires motivate future great hires to join companies. Bad hiring experiences negatively impact a company’s brand and reputation.